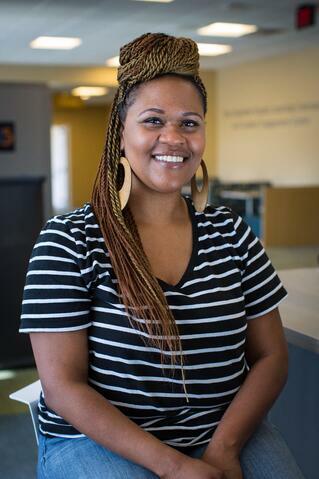 It's been a year since LaToya joined the Respiratory Therapy Associate Degree program at Nebraska Methodist College. She's grown to thrive in the role, and when asked, LaToya’s classmates admire her relaxed, caring attitude toward patients. This outer calm is remarkable given the journey she's gone through to get here. A Texas native, LaToya moved to Omaha to be with her son, Tadrean, while he waited to receive a liver transplant. During his months on the transplant waiting list, Tadrean needed round-the-clock care, and LaToya stayed at the Ronald McDonald House at night. At one point, LaToya received even more devastating news: Tadrean was diagnosed with acute chronic respiratory failure. This new diagnosis meant that, in addition to a liver transplant, Tadrean needed a respiratory therapist. LaToya vividly remembers the months of treatment endured by her son. She had never had to deal with a respiratory therapist before, but the experience wasn't what she expected. Thanks to his caring, positive attitude, her son's respiratory therapist stood out in the room of doctors and nurses. His name was Mitch. LaToya said she wanted to learn everything she could to make sure Tadrean’s return home from the hospital was successful. When Tadrean needed a high level of oxygen that made LaToya feel uneasy, she was able to call Mitch immediately. “Mitch helped me put how my son was feeling into perspective and explained that he needed more oxygen because of the stressful move,” LaToya said. Mitch acted as more than just a consultant going through the technical motions. He showed her the big picture of healthcare, particularly what it meant to be a respiratory therapist, where empathy can be as big a virtue as medical skills. What's more, Mitch saw LaToya's calmness in the face of a situation that could prove too much for many people. 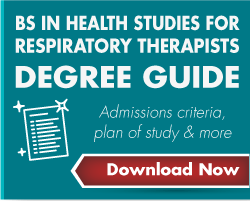 This actually led him to recommend the respiratory therapy program at Nebraska Methodist College. “I would do anything for my son, and I began to see having someone with a respiratory-therapy skill level would be the most helpful,” LaToya said. It wasn't something LaToya had thought about before, but once the idea was born, she knew it was the right call. Although she only had 10 days to register and enroll before the program began, LaToya knew NMC was where she had to be. She began the program on time but not without effort. “I’ve never had to work so hard so fast. It took me three days but I was determined to get it done and go,” said LaToya. After having worked full time for 16 years, a change in course was just what she needed, she said. LaToya felt nervous about class but she didn’t hesitate to ask questions. The appreciation goes both ways with LaToya and her cohort. Her peers recognize her hands-on personal experience with respiratory therapy and her levelheadedness when working closely with patients. “They always want to know how I’m able to stay so calm, but really it’s because I know there’s worse that could happen. I always remind myself ‘someone is having a worse day than you’ and that brings me peace,” LaToya said. Congrats on a successful start to your career at NMC, LaToya!